Using scissors is a skill that is not always easy to master for pre-schoolers with tiny hands. It’s an important skill that prepares children for handwriting and using a pencil. In order to master scissors, a child needs to be able to use their index finger, middle finger, and thumb separately from their other fingers. 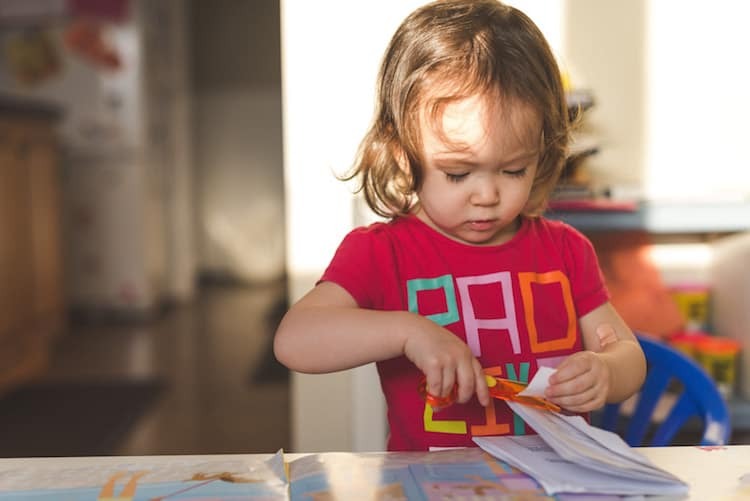 You can help your pre-schooler develop their scissor skills by introducing them to activities that strengthen their hand and finger muscles and improve their bilateral coordination. Use kitchen tongs to stack small blocks or to move cotton balls from one container to another. Tear paper into small pieces to improve the ability to use both hands in a coordinated manner. Spin a top to exercise the muscles in the thumb, index, and middle finger. Punch holes on index cards with a handheld puncher to strengthen the hand muscles and improve bilateral skills. Squeeze water out of squirty-toys in the bathtub so hand muscles get a workout. Use an eye dropper filled with dye or paints (develops fine motor skill). Play with finger puppets – it’s entertaining and addresses finger isolation and dexterity. Place clothes pegs on the edge of a paper plate or ice cream container to strengthen small hand and finger muscles and encourage bilateral skills. When your child is ready, introduce the scissors. Position their wrist so that the thumb is turned upward, the thumb joint resting inside the thumb loop. Make sure the tip of the middle finger is inside the opposite loop. Some scissors have enough space for both the middle and ring fingers to be positioned inside this loop – most children seem to prefer this when learning. Place the index finger outside the loop, in front of the middle finger serving as a guide. Provide lots of safe items to cut (cutting playdough sausages is nice and easy and it doesn’t matter where they cut it) – and lots of practice. Using scissors efficiently is a complicated skill. It’s a skill your child will benefit from learning early. Lightbulb Learning Childcare is a brand new Mt Wellington child day care centre near Hamlin Hill offering quality care and affordable education for children aged 3 months to 5 years old.